Today was the day the Craviotto family walked through our 100 year old Shop to look at all of the tools, scrolls, machinery, and memorabilia, deciding what items to keep and what to sell. It’s time to say good-bye to Craviotto Brothers Ironworks. The business has been a part of the Santa Barbara landscape for almost 100 years, but now it’s time for its corrugated iron doors to close forever. A “Going Out of Business” sale will take place April 25 at what our family has lovingly called “The Shop” ever since three generations have worked there. It was started by this man, Erasmo John Craviotto. E.J. Craviotto bought the land in 1914, but when WWI called his name and he went off to Europe to fight, he left the Shop in the capable hands of his brother, Fred Craviotto. That’s when the Shop was named Craviotto Brothers. When E.J. came back from war, his brother moved on, and E.J. ran the business until 1958 when his two sons, Charlie and Danny Craviotto, took over. When most people think of Craviotto Brothers nowadays they think of these two brothers. You almost never saw one without the other. They used to finish each other’s sentences, and sometimes they didn’t even need to finish them to understand what the other one was saying. They went everywhere together, did everything together – work, play, and vacations. You could see them at lunch time, sitting in the open doorway of the Shop, eating their sack lunches, watching the girls walk by, and commenting on the world for thirty minutes a day at noon. Some of us called them the unofficial mayors of Anacapa Street. Danny used to say, “I couldn’t have picked a better brother, a better friend or a better business partner.” Charlie never said the same thing because he didn’t have to – his brother said it for him. They were as close as any two brothers could ever be except for twins. Danny, on the left, and Charlie, on the right. Charlie, on the left, and Danny, on the right. Charlie passed away in 2004 and Danny followed after him in 2011. But the Shop still remained. Now, it’s time for the Shop to go. Today, Danny’s widow, Carmen, and the children and grandchildren of Charlie and Danny, walked through the shop and had to do an impossible task – We had to choose the artifacts of 100 years of hard work that our individual families will keep, while allowing the rest to be sold to the public. While we did this, two pigeons (two, not one, or three, or any other inappropriate number) flew into the Shop and perched in the rafters high overhead, watching us as we worked. And there sat those two pigeons for the whole day, just watching us pick through all the artifacts from a business that was started in 1914, passed off from the father of those two boys, who groomed and grew the family business into a Santa Barbara tradition, a tradition that saw three generations of workers trained there, learning not only how to be iron workers, but also how to be Craviotto men. And here’s the thing: It was two pigeons, not two sparrows, or two Jay birds, or two hummingbirds. Two pigeons. Danny Craviotto used to raise and race homing pigeons, with his pigeon coop in the backyard of his ma and pa’s house over on San Andres Street. 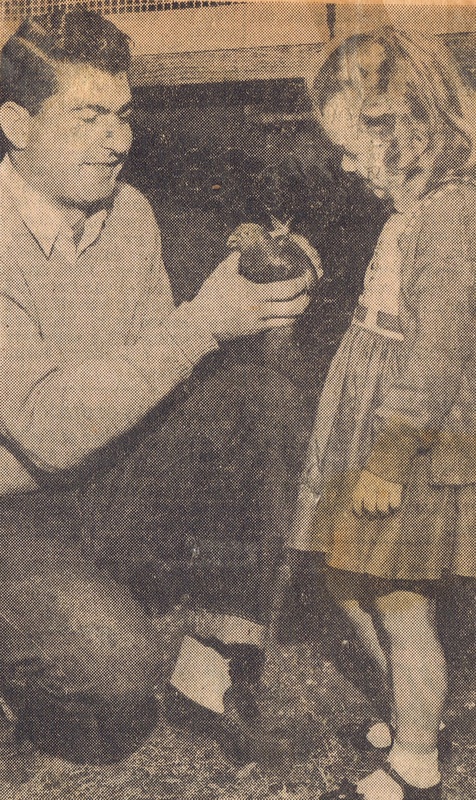 That’s Uncle Danny and me with one of his pigeons. He really loved those birds, and he especially loved that he could take them anywhere, release them, and let them fly high into the sky, flying far away. But they always came home. I never see a pigeon without thinking of my uncle, and it always gives me a sense of comfort to know that a pigeon will always recognize his home and know how to get back there when he’s ready. 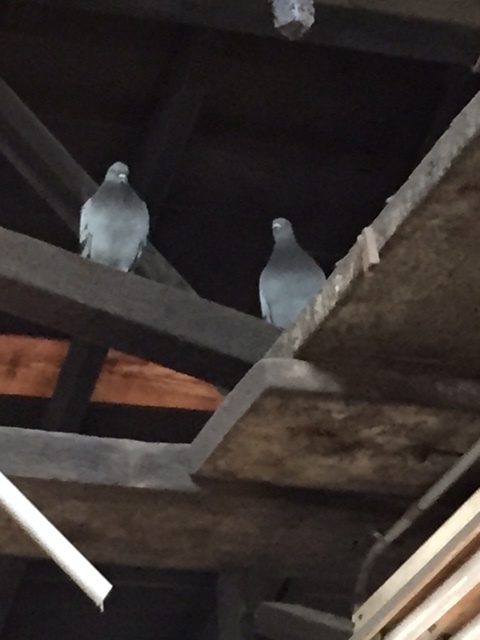 Today, we looked up at those two pigeons sitting high up in the rafters of the Shop and we smiled at them. We also shed a few tears just seeing them there. Here’s a photo my cousin, Dan, took with his phone. We were all in agreement that Charlie, the big brother, was on the left – looking puffed up and wanting to take on the world, while Danny, the younger, was on the right, still at his side, always the loyal brother.